Creative spirit, taking pride in our county, and having fun are what The Roanoke Valley Rocks program is all about! Weldon Elementary School, especially the 80 fourth grade art students, exhibits all of those qualities and more! Art teacher Mrs. Riley wanted her students to truly experience being artists and participating in The Roanoke Valley Rocks program. 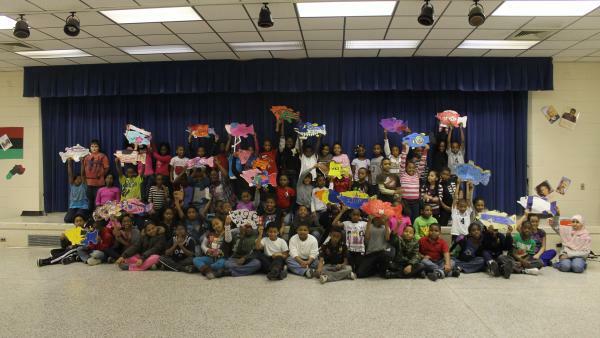 She had her students look at all of The Roanoke Valley Rocks fish designs on VisitHalifax.com. Afterwards, they each filled out a mock artist application to participate in the program and drew their individual design on the back of their applications. Riley put them in groups, where they selected a teacher’s name out of a hat to do a design for that teacher and combined the best of each of their ideas into one design. “I was very impressed with my students this year. I didn’t give them much direction at all, and they just went with it and came up with ideas all their own,” said Riley. “I really liked the way they took the best parts of each individual design to create one big idea.” On Thursday, March 7, Halifax County CVB President/CEO Lori Medlin and Tina Gregory, member of the Halifax County CVB board of directors and Roanoke Valley Rocks artist, met with the students to talk to them about their designs. The designs were amazing, featuring anything from a Reading is Fun theme to Mickey Mouse, from the Weldon Chargers to pro teams like the Florida Gators and Dallas Cowboys, from a purple panda to ice cream cones. One group created a flamingo fish for their teacher Jan Wicker because she loves flamingos, and one group painted the emblem of the US Navy because their teacher used to be in the Navy. Gregory offered insight into what it is like to be a professional artist, and the kids asked her some fantastic questions. At the end of the sharing session, Medlin and Gregory presented the students with Halifax County coloring books that feature all of the wonderful things there are to see and do here.